Setting a Bentline - A Day With E.J. I guess it takes all kinds of skills to make a living if that living is done in many different ways. Some of these skills are still being invented every day, as the need for them arises, and some of them are fading out, as the need for them diminishes. But that doesn’t mean that the older, practiced, skills are any less vital if they are what you use to make a living, even today. Such a set of skills is the subject of this posting. 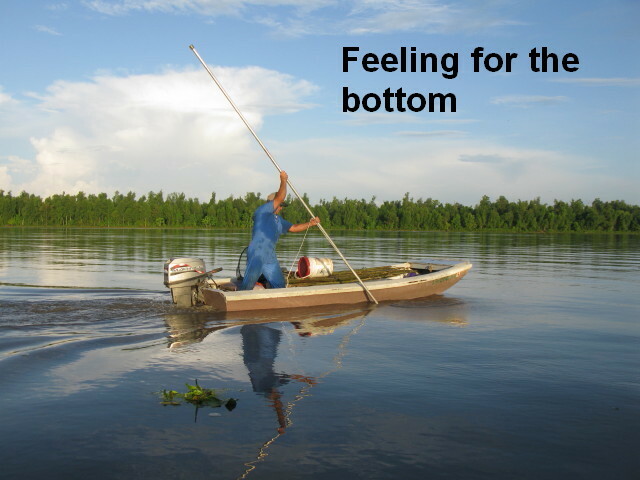 Many years ago I was privileged to spend a lot of time learning how to make a living commercial linefishing for catfish. The people who taught me everything I could learn about this were the families who lived in the community of Myette Point. These families have since dispersed to various locations around the Bayou Teche region, but many of them still retain the set of skills that it ta kes to practice linefishing, and a few still use the techniques. One of these men is E.J. Daigle, of Franklin, Louisiana. E.J. and I have been friends for about 38 years and he recently agreed to allow me to accompany him on a day when he was going to set out a new rig of lines in Grand Lake. I don’t believe this has ever been documented fully, and I was happy to take him up on it. The idea was to video the use of the tools that are part of this practice, and also to take as many still pics as I could. The video will be assembled from 32 segments that I now have, but perhaps a few of the still pics can illustrate the topic in this posting. 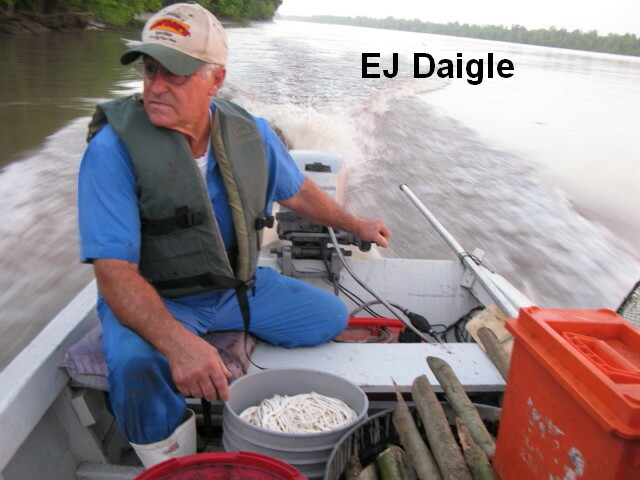 It is a pleasure to go out into the Atchafalaya Basin with some one who has inherited knowledge from a long line of Basin people. E.J.’s linefishing pedigree stretches back to his great grandfather Claiborne Mayon (born in 1859). It is easy to feel overwhelmed just thinking about that. How many volumes would it take to discuss all of that accumulated knowledge? I don’t know, but sadly I do know that it will never be done. E.J. is one of the last of his line to have this information and still use some of it in his daily life. That’s why I say that experiencing and documenting even a little of these techniques is a privilege. Today was about setting a bentline. This technique was developed by the people who came to live on the margins of Grand Lake, in St. Mary Parish, generations ago. The technique was defined by co nditions found in the big lake, rather than being imposed upon it from the outside. The principle condition is that of a constant current of moderate to strong strength and a more-or-less uniform depth of six to ten feet at the low water stage. The channels are deeper, of course. The other factor, that of very long line length, was also a product of the miles-wide lake. Coming to live here was an opportunity for invention, and invent they did. The primary requirement for a catfish line to be successful is that it must fish where the fish live, i.e. 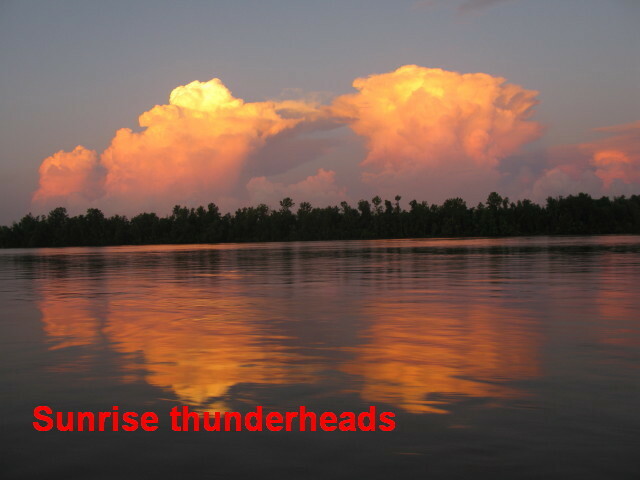 that part of the water column which is “home base” for the three species that are commercially marketable – blue, channel and flathead catfish. Home base in this case is near the bottom. So, the line must be presented to that location. The bentline set does this. The second thing is for the line to be long enough to cover as much of the lake as possible, and still be within the physical limits of a fisherman to run, bait, repair, etc. This length is usually at least 6,000 feet. At this length there are about 1000 hooks to service every day and get bait for. Some people space the hooks eight feet apart, lengthening the line to 8,000 feet. This is usually enough to cover enough different conditions on the lake to provide success on at least part of the line every day. Which part catches fish will vary. Oddly, almost never does the whole line catch. Perhaps the most important factor in managing a line that long is how to divide the line so that only part of it is subject to the power of the current. This is done by providing anchors at set distances. The anchors consist of short pieces of sapling, either will ow or sycamore, called stobs that are hammered into the bottom using a long pole called a stob pole or jigger pole. To do this a stob is inserted into a two-foot long pipe at the end of a long pole. A piece of strong line is tied to the stob near where it emerges from the pipe. This line will become the bridle. The whole thing, pole, stob and bridle line are lifted, positioned properly according to where the line is to be placed, and plunged to the bottom. The stob is hammered into the bottom with the jigger pole. 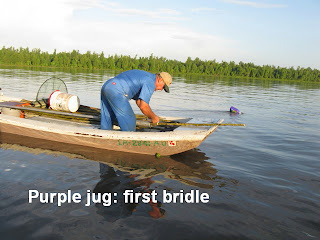 Once the stob is secure, the pole is lifted back into the boat with the fisherman still holding the bridle line tied to the stob now anchored securely. This will be done a number of times before line is attached to the bridles, so a float of some sort is tied to the bridle and released. 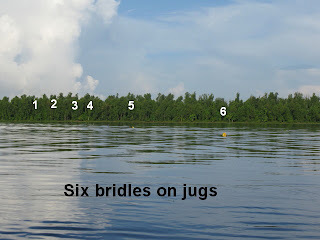 The distance between bridles varies somewhat with the fish erman, but most set the distance between 25 and 30 hooks long – about 150 feet for a six-foot spacing. This spacing is called a bent, though no one I have ever spoken with knows why. People will refer to a line ten bents long, or 15, or whatever. 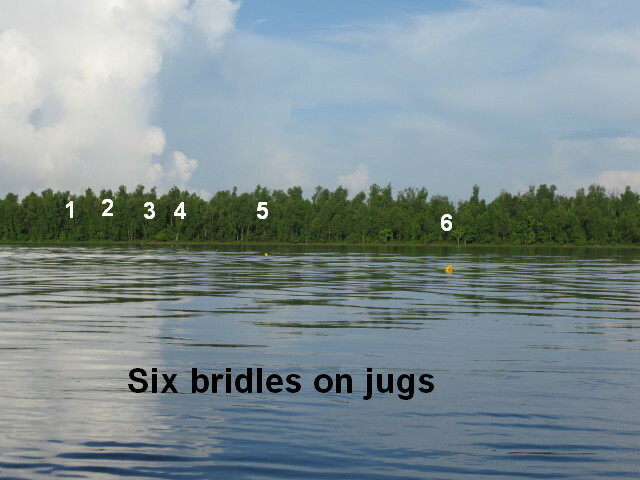 Once all the stobs (anchors) with attached bridles are in place (E.J. puts in six for this piece of the line), in a straight line across the current, it is time to attach the business end of the bentline, the main line with hooks. This is done various ways. If it is a new line, some people choose to tie on just the main line and come along after to tie the hooks to it. If it is a line that has been fished before, several ways exist to put out line with hooks already on it. Each of these is a procedure requiring patience and much skill. The technique used by E.J. and others at Myette Point is to coil the line in a tub as it is taken up from a previous set, and then dispense it hook by careful hook as the line is paid out slowly during resetting. 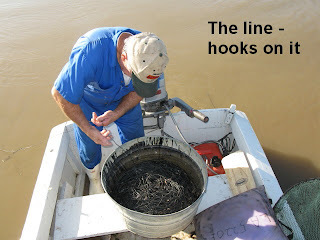 Other people have other methods for keeping 1000 hooks from becoming entangled, including hooking each hook on the side of the tub as the line is brought in. It probably just depends on how you learn and from whom. After setting the stobs, E.J. will go to one end of the row of jugs and tie the main line to that bridle. Then, while keeping track of the current and the drift of the boat, with the engine running slowly, he begins to take the line out of the tub and pass it along behind him into the water, one hook at a time, counting out about 25 hooks. 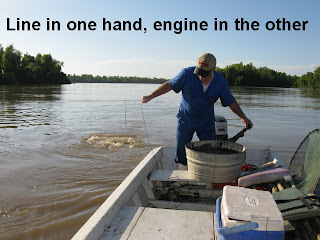 When he has what he thinks is enough line out, he holds the line securely in one hand, using the other hand on the engine to run slowly to the next jug. Reaching it, he evaluates the amount of tension on the line he has paid out, brings in some or lets a little out, and grabs the bridle near the jug and ties the main line to the bridle. He repeats this until the main line is connected to each bridle previously set. If this sounds easy, you have never tried to do it. A l ot of people try to learn to keep track of the hooks coming out of the tub, the current, the engine and the wind , at the cost of hooks imbedded in a hand, or worse. If you make that mistake, you really have to want to learn to try it a second time. 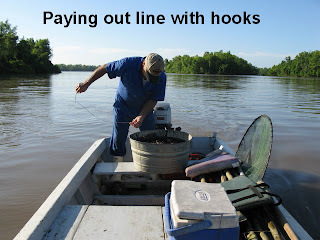 Assuming you have acquired enough bait already that day to actually make the line begin to fish, you begin baiting at one end, left or right, and attach sinkers near each end of the line because there may be floats at each end and you don’t want the line to ride up because of them. Once all that is done, the line is in place and is fishing. Tomorrow you might harvest something you can sell. 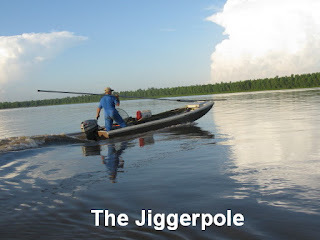 Actually, a six-bent line will only have 150 hooks on it, and if you want a rig of 1000 hooks, you have to start with the jigger pole and stobs again. And that is how it went. 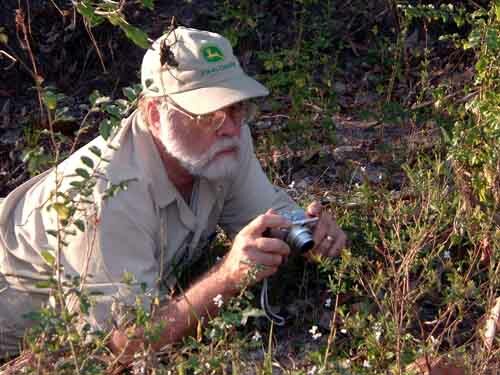 It is such a pleasure to be out with someone like E.J. 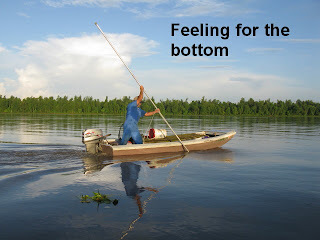 Daigle – to watch him move about in the boat and move from task to task with no wasted effort, to watch things come together from just an idea of something to the completion of a complicated fishing set. 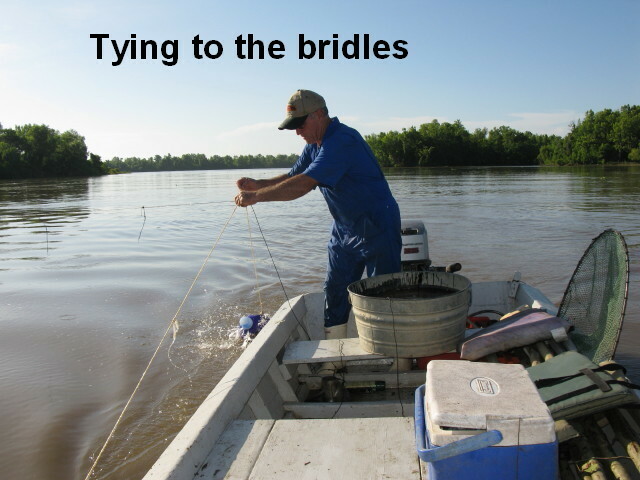 Earlier he visited some shrimp traps that yielded several hundred river shrimp, and that cannot be taken for granted either. It was a very good day. The river is at 11 feet on the Butte La Rose gauge, staying steady for the next week or so. The Ohio and Mississippi are not doing much to change that right now.